This salad (from The China Study Cookbook) is one of those perfect summer dishes. 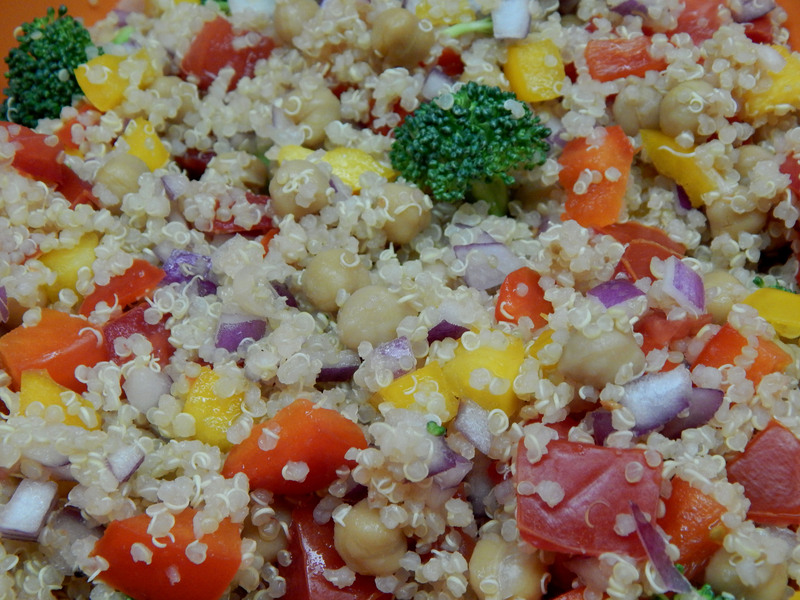 It’s healthy (full of fresh veggies and protein-packed beans and quinoa). It’s pretty – almost like confetti. It’s perfect as a side, a main, or a potluck dish. And since it’s mostly chopping and mixing, not cooking, your kitchen will stay cool. Oh, and of course it’s vegan AND it’s gluten free! This recipe is from the original China Study Cookbook by Dr. LeAnne Campbell and shared with the author’s permission. Heat 2 cups water and quinoa until boiling in medium saucepan over high heat. 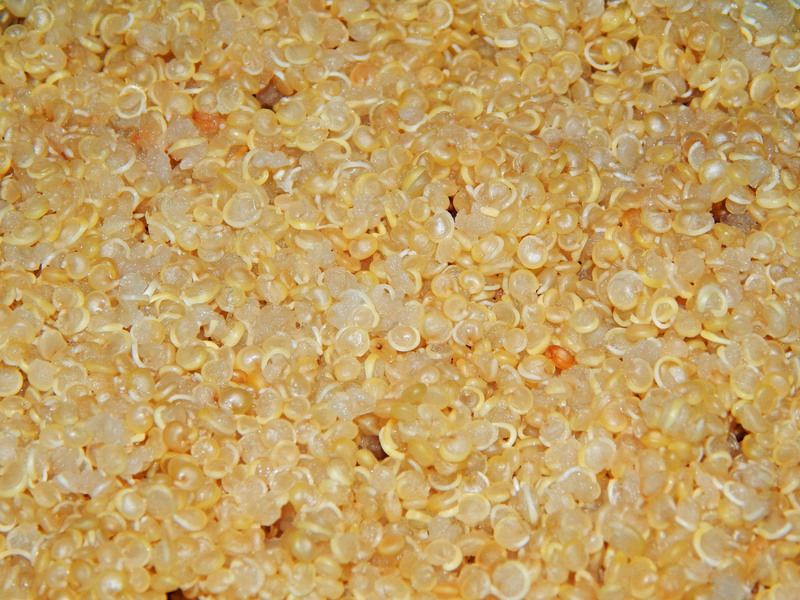 Reduce heat to medium-low and simmer until water is absorbed and quinoa fluffs up, about 15 minutes. 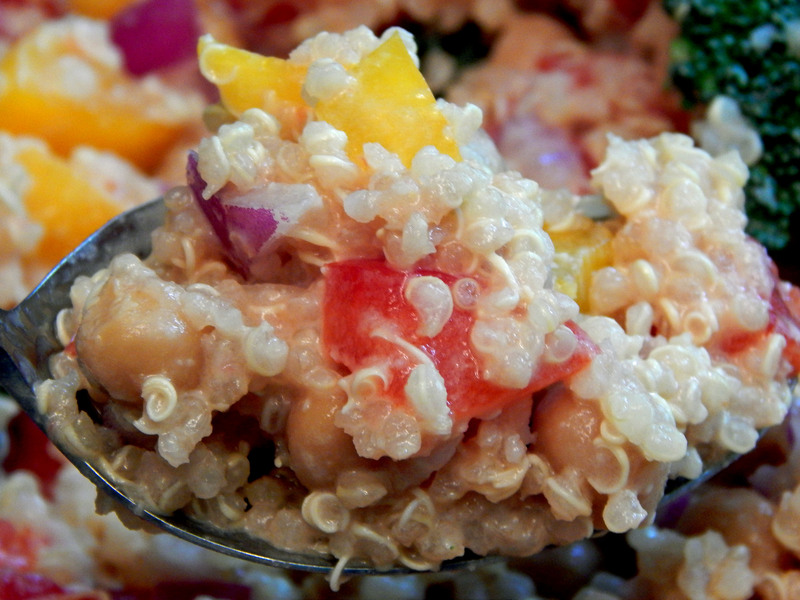 Quinoa is done when it is tender and there is a pop to each bite. 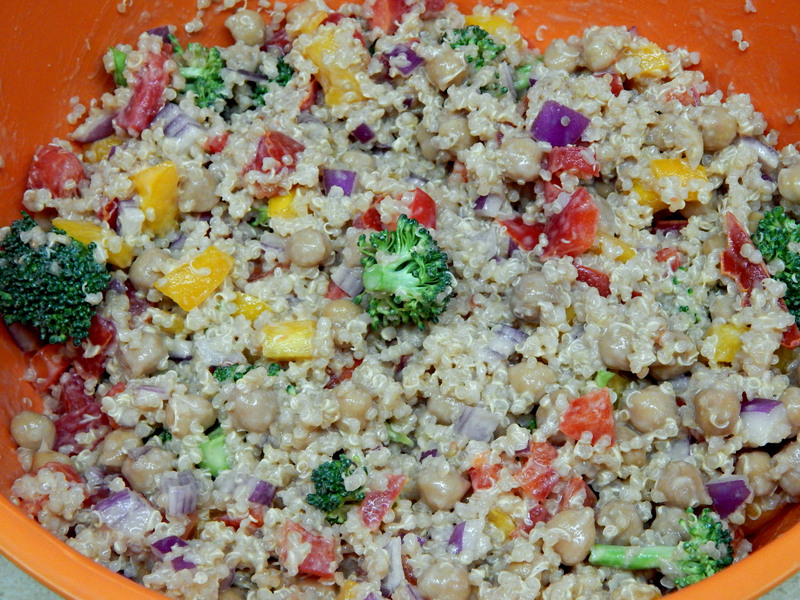 Drain water and place quinoa in mixing bowl. Add onion, broccoli, peppers, tomatoes, and chickpeas. 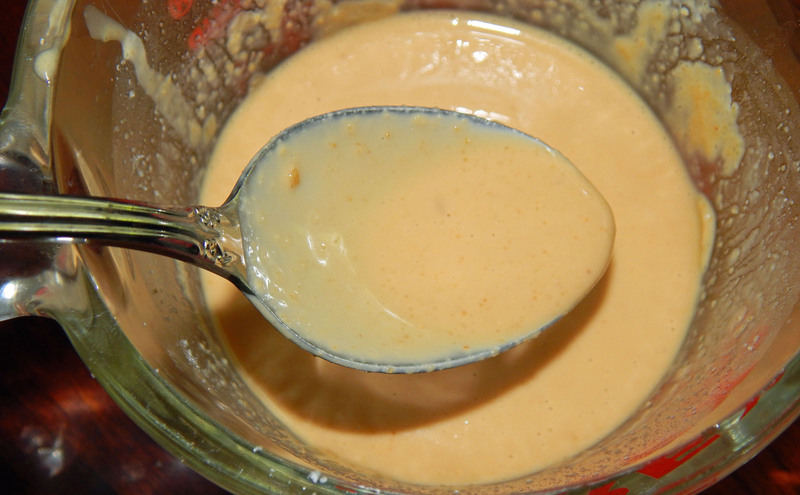 To make the sauce, whisk together all sauce ingredients. Add the sauce to the cooked quinoa and vegetables. Mix. Serve garnished with a bit of cilantro. 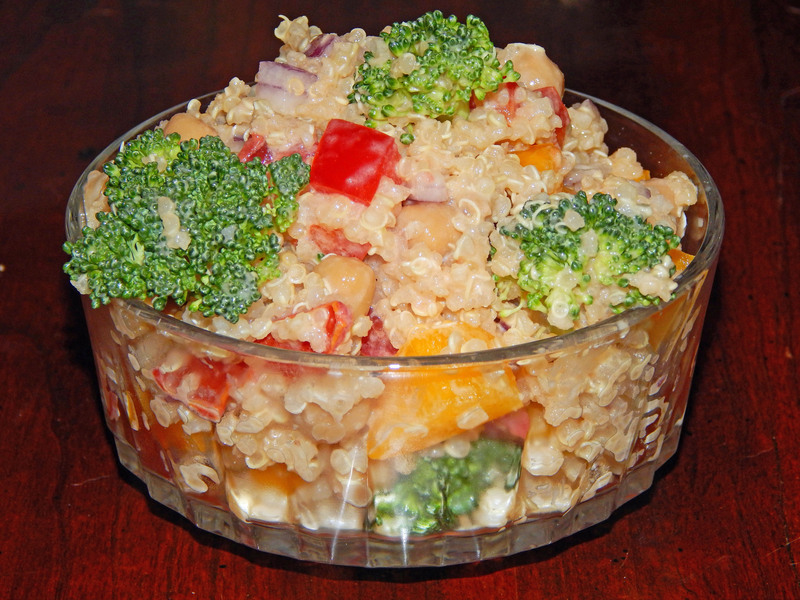 Like many great recipes, this salad is flexible and you can customize it to your taste. I made this with chickpeas, as the recipe called for, and it was great. (Chickpeas and tahini are an all-time classic pairing.) My friend Jennifer didn’t have any chickpeas on hand, so she used canned kidney beans. It was just as good, if not even better! So, try a can of your favorite beans if you don’t have chickpeas. Be flexible with your vegetables. I like to add extra broccoli to this. LeAnne suggests adding a cup of fresh corn to add color or to spruce up leftovers. If you don’t have red onions, a sweet vidalia onion will taste just as good, even if it doesn’t look quite as pretty. Same goes for peppers – red and yellow peppers look pretty, but if all you have is a green pepper, use that! If you don’t like cilantro, use fresh parsley to garnish. Finally, I like to serve with a small slice of lemon – I like that extra bright note of fresh citrus on my salad right before I eat. 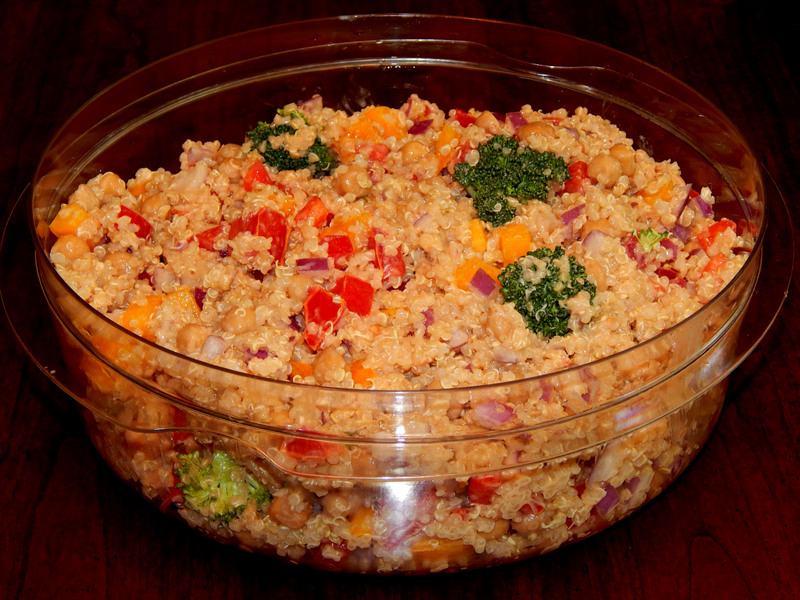 This is a great dish to take to potlucks and cookouts! I hope you enjoy this summer salad as much as I do! And please keep reading in the coming weeks for a review of The China Study Cookbook and the new China Study Quick & Easy Cookbook, more China Study recipes, advice from Dr. LeAnne Campbell on raising vegan children, and news about her work with Global Roots.